Les Baux-de-Provence is a beautiful village in the Provence region of southern France that is known for its historic ruins. It is located atop the Alpilles mountains, and is named from the Provençal term bauç, which means “rocky spur”. The village is famous for its picturesque views and its various historic sites, including a castle, a church, and several museums. It is currently home to approximately 400 people. The area now known as ‘Les Baux-de-Provence’ has been settled for thousands of years. There is evidence that it was inhabited as long ago as 6000 BC, and was later used as a hill fort, or oppidum, by the Celts in the 2nd century BC. Its location atop a hill has made it a desirable location for centuries since it is easy to view the surrounding countryside and therefore protect the area. Starting in the Middle Ages, the area was ruled by the Lords of Baux , who constructed the village’s now famous castle. Starting in the 15th century, the land belonged to the throne of France, and the king ordered the demolition of the castle, though some of it was later rebuilt. Eventually, the village was abandoned, but in 1821, French geologist, Pierre Berthier, discovered an ore there that is now the world’s primary source of aluminum, which he named bauxite after the village. Since World War II, the village has become a popular tourist attraction, and is often listed as one of the most beautiful villages in all of France. 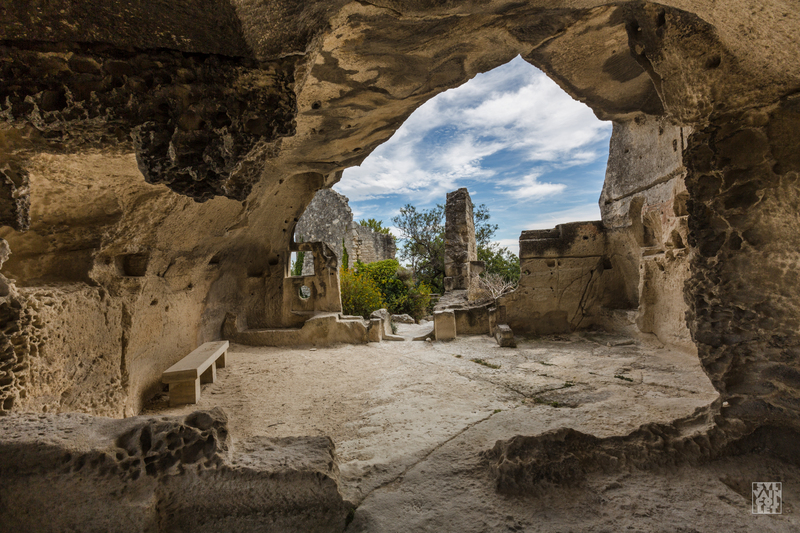 Les Baux-de-Provence is primarily known for its castle and extraordinary views of Provence, but is also home to several other attractions, including a church and museums. 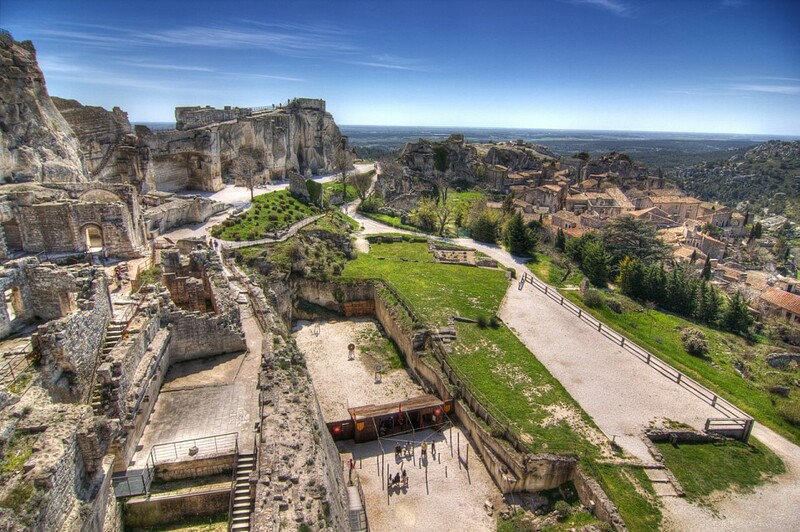 The most popular attraction in Les Baux-de-Provence is its castle, known as the Château des Baux in French. Constructed in the 10th century, this historic monument was the home of the Lords of Baux for hundreds of years and provides spectacular views of Provence. Using an audio guide tour, visitors can hear the story of its inhabitants and explore its keep, towers, and chapels. Some of its most fascinating features are its full-scale replicas of siege engines, including the largest trebuchet in Europe, a couillard counterweight machine, a ballista, and a battering ram, which are occasionally used in thrilling demonstrations you won’t want to miss. Each year between April and September, the castle celebrates Médievales des Baux, which includes special daily events such catapult shooting, Maître d’armes shows, crossbow shooting for visitors over the age of 5, and shows related to the art of animal dressage. Hours: Open daily from 9:00 until 18:30 through 20:15 (depending on season), with shortened hours from 10:00 to 17:00 from November through February. Prices: Admission to the castle costs €8 ($9.20) for adults, €6 ($6.90) for children 7 to 17 and students, and is free for children under 7. Between April and September, an additional €2 ($2.30) is added to admission prices due to the inclusion of special activities. This beautiful Romanesque church constructed in the 12th century is known for its modern stained glass windows that were a gift from Prince Rainier III of Monaco, who was at one point the Marquis of Baux. Other popular features include an impressive sculpture of a lion and its circular turret, which is decorated with gargoyles. This 16th-century mansion is known for its remarkable paintings depicting the four seasons and the four cardinal virtues, as well as the mythologically-themed fresco on its fireplace. Today, it is home to the Yves Brayer Museum, which features numerous works by French painter, Yves Brayer . Hours: Open daily from 10:00 to 12:30 and 14:00 to 18:30 (April through September), open every day except Tuesdays 11:00 to 12:30 and 14:00 to 17:00 (October through December and March). Prices: Admission costs €5 ($5.75) per person, and is free for visitors under 18. As you explore the village, you’re likely to come across its historic mullioned Renaissance window, the only remains of a large 16th-century mansion. The window features the inscription “Post Tenebras Lux 1571”, which is connected to Calvinism. The Musée des Santons features an impressive collection of santons, handmade figurines used in Nativity scenes. These fascinating works of religious art are especially fascinating for young visitors. The small museum is especially popular since it is open every day and offers free admission. 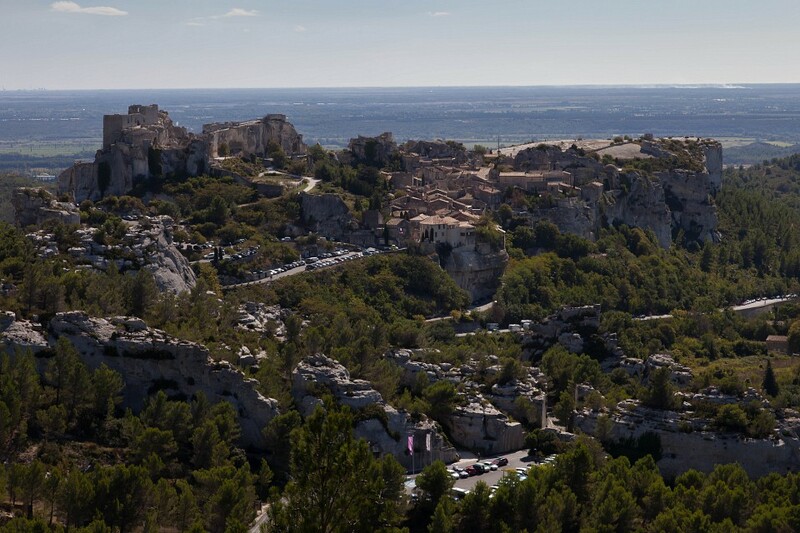 The best way to reach Les Baux-de-Provence is by car due to the magnificent vistas that the Provence region provides. 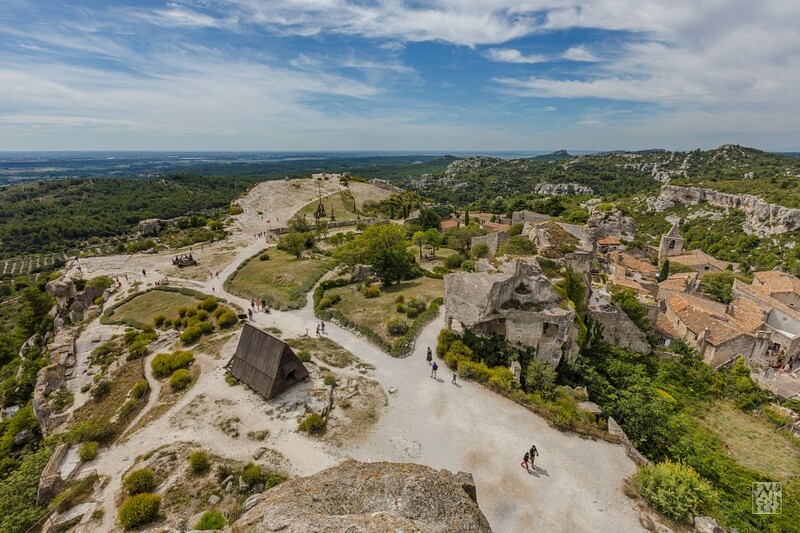 However, if you don’t have a car, the easiest way to reach Les Baux-de-Provence is by bus. The Cartreize bus service between the cities of Arles and Saint Rémy de Provence (line 57) stops in the village multiple times each day and costs approximately €2..
Other popular attractions in the region include the Pont du Gard, Carcassonne, and cities such as Toulouse, Marseille, Arles, Narbonne, and Nîmes.